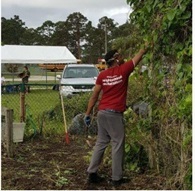 Day of Caring at Gifford Youth Achievement Center’s Learning Garden – a commitment to the community and its youth. On October 14th, 2017, the United Way held its largest one-day volunteer event in our community: the Day of Caring. 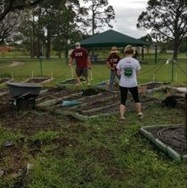 United Way, Habitat for Humanity, and Indian River County Master Gardener volunteers served at the Gifford Youth Achievement Center’s (GYAC) Learning Garden. It was an honor for our garden to be selected by Habitat for Humanity as one of their service projects for this year. Over 15 volunteers assembled at 8:30 Saturday morning to help reclaim the garden from summer inactivity. Volunteers worked until 12 noon pulling weeds, installing plants, and spreading mulch into various beds. The garden is now ready for a new school year of learning and interesting activities for our young people. The GYAC Learning Garden provides youth ages 6 to 13 with a connection to nature and various STEAM (science, technology, engineering, agriculture and math) activities. Young participants are offered various ways to interact with the natural world through gardening, small pond management, and other projects. Instruction follows the 4H Junior Master Gardner curriculum, and our young people are learning life and leadership skills that will help them become productive citizens in the future. 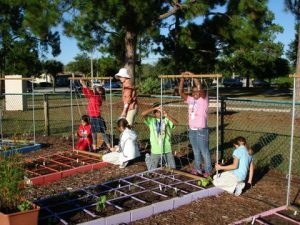 Indian River County Master Gardeners are dedicated to the fostering and facilitation of gardening activities in this underserved neighborhood. We actively solicit community engagement to maintain and expand our garden in the Gifford area. This garden is also a demonstration area showing the use of Florida-Friendly Landscaping techniques. Our pollinator area, herb boxes, and vegetable garden plots are maintained in a low maintenance and sustainable manner. With a BS in Plant Science, Nickie embodies Florida Friendly Landscaping and anything ethnobotanical.